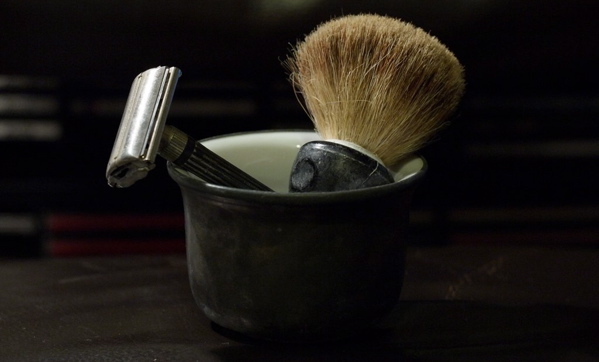 There’s a reason the old-fashioned shave is making a comeback. Guys are realizing that shaving need not be a nuisance; rather, with the right products, it can be a meditative pleasure, and a moment of private indulgence. Here, the stuff you need to kick it old-school. The first step to shaving nirvana is upgrading your cream. Since the 1940s, wise barbers have trusted London-based shaving supply maker Cyril R. Salter for products like this densely textured, citrus-scented cream. You should, too. 200 ml, $19.50. To build that luxurious lather, you can’t use something so crude as fingers. For the softest, most supple feeling against your skin, nothing beats silvertip badger hair. The large 28 mm knot on this brush holds loads of hot water and cream for effortless lathering. $162.50. Any fears of ditching your beloved seven-blade razor will evaporate the moment you feel the solid heft of the Edwin Jagger DE89. It is a serious tool for serious men. It might take a nick or two, but you’ll quickly learn how to handle this classic shaving instrument to produce incomparable results. $39.75. (50 blade sampler, $14.95). Go retro with this moisturizing glycerin-based formula. The muted lime aroma will invigorate you, and your skin – perhaps accustomed to years of harsh alcohol balms – will thank you. 200 ml, $40. I’m running right out to my shaving store! I switched from the over-priced and way over-engineered systems about a year ago and have no regrets. I lost a little blood at first, but actually, for the first time in my life, enjoy shaving. I’ve also beaten the annoying razor bumps and burns generated by 4, 5 or 6 blade monstrosities. As for the cost – it is true the start up cost is high – but within months you end up ahead. My cost for a blade is around 45 cents for a super-high-end product. Others run around 30 cents. Plus – with a warm blade against your neck, you feel like a man.